WASHINGTON - Brazilian aircraft manufacturer Embraer has agreed to pay more than $205 million to resolve alleged violations of the US Foreign Corrupt Practices Act (FCPA) as part of a global settlement with the Securities and Exchange Commission (SEC), the US Department of Justice and Brazilian authorities. The complaint against Embraer alleges that the company made more than $83 million in profits as a result of bribe payments from its US-based subsidiary through third-party agents to foreign government officials in the Dominican Republic, Saudi Arabia, and Mozambique. Embraer allegedly created false books and records to conceal the illicit payments, and also engaged in an alleged accounting scheme in India. According to the company’s admissions, in 2008, Embraer paid $3.52 million to an influential government official in the Dominican Republic via a false agency agreement to secure a contract to sell the Dominican Air Force eight military aircraft for approximately $92 million. “Embraer’s alleged misconduct spanned multiple continents, and it has taken significant ongoing coordination among international regulators and law enforcement agencies to uncover the company’s complex bribery schemes,” noted Kara Brockmeyer, chief of the SEC Enforcement Division’s FCPA Unit. 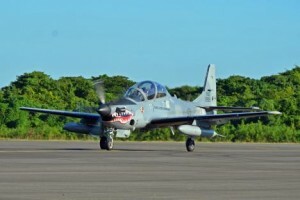 Authorities in the Dominican Republic previously arrested a former defence minister and three others for allegedly accepting the $3.5 million bribe from Embraer in exchange for placing an order with the Brazilian aircraft manufacturer for eight Super Tucano aircraft. The Dominican Republic government said they used the planes, which have bubble glass cockpits and noses painted with growling teeth, to combat aerial drops of drugs from South America. Those arrested include Pedro Rafael Pena Antonio, defence minister from 2008 to 2010, Air Force Colonel Carlos Piccini, businessman Daniel Aquino Mendez and his son Daniel Aquino Hernandez.